Bad cavities can happen to healthy families. Most of the people I consult with are shocked to discover their toddler has cavities. They are stunned and confused, since they have healthy diets, breast-feed their babies, and subscribe to natural medicines and organic lifestyles. The myth that must be broken is that flossing and brushing will stop cavities. Even if it were possible to brush and floss perfectly, only 40 percent of plaque can be removed by mechanical cleaning. No toothbrush bristle can clean the tiny grooves of molar teeth – which are the most vulnerable areas for cavities and the place bacteria lodge and colonize. In fact, studies show that the kind of bacteria in these molar grooves, usually dominates the mouth’s ecology. If healthy bacteria set up “home” in the molar grooves, healthy bacteria will likely protect the mouth for years, possibly for life. For an infant or toddler with cavities, I recommend frequent applications of small amounts of xylitol, wiped or brushed onto teeth during the day, to rid the mouth of harmful bacteria and promote healthy ones. Morning and night, moisten a soft toothbrush with one drop of bubblegum ACT rinse and brush the affected teeth with this. The benefit of combining a little fluoride with some xylitol has been shown to speed healing and repair enamel. A children’s Nimbus brush is very soft and is excellent for this purpose. For an older child, or if cavities are more severe, a rice-grain amount of Crest Original toothpaste can be brushed or wiped over affected teeth to speed enamel healing. Not only does xylitol eradicate unhealthy plaque from teeth but it also cleans away harmful bacteria from other places in the mouth and even from saliva. As xylitol dissolves in the mouth it penetrates the grooves of molar teeth and dislodges dangerous bacteria while promoting healthy, protective ones. It is important that your child has healthy mouth when teeth erupt – baby teeth and adult ones. This method of preparing the mouth for the eruption of teeth has been called prevention using “windows of opportunity” – using the eruption of teeth as special moments when a good diet and xylitol can affect a child’s dental health for life. 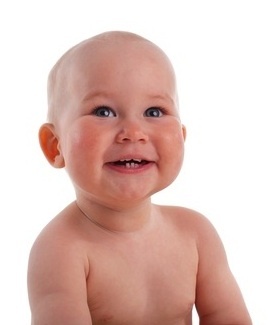 Baby molars erupt in the second year of life, and adult molars often begin to erupt around 4 years old. Remember to clean family toothbrushes with Listerine, rinse and store so they dry completely between uses – preferably in sunlight. Bacteria die when they dry!